Hello friends in this tutorial we are going to learn something new topic. In this post we will make simple pie chart by using Google chart library with php script and mysql database. This advance topic in web development with php programming. For making pie chart we will use Google chart library for making pie chart and we have pass mysql data by using php programming in json format. Because Google chart library only work with data in json format. If you have developed any analytics project and you have to display data result into any type of chart. Then you can use Google chart Library that provides very powerful chart making tools that you can use for making charts very simple and in this web development tutorial we will describe you how to use Google charts with PHP and Mysql data. Here we have load Google chart library and then after we have define the package of Google chart library. By using this loader we can make different type of chart like bar, column, line, area, stepped area, bubble, pie, donut, combo, candlestick, histogram, scatter. As per your requirement you can make different type of chart as per your requirement. You can display large number of data converted into different type of chart as per your requirement. Then after we have added data into Google chart library class and after this we have define which type of chart you want to draw, here we have define pie chart and after this we have set different options of chart and lastly we have draw chart by using draw function. 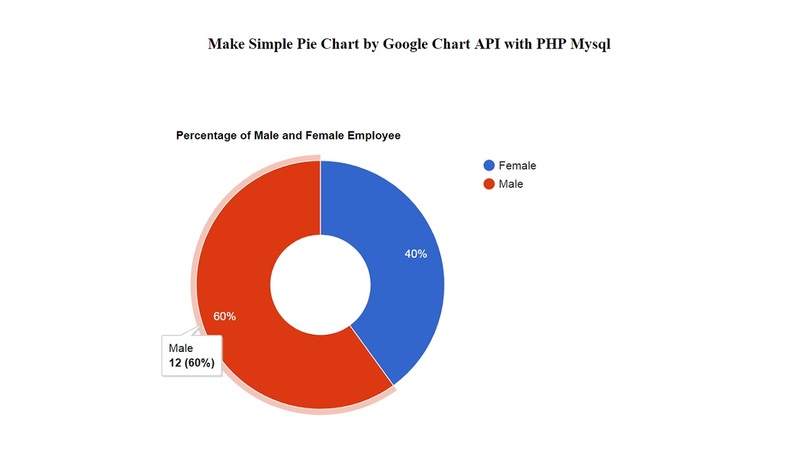 This way we have create simple pie chart by using Google chart library with php script and mysql database. By using php and mysql data with Google chart library we can make dynamic chart. Your this tutorial was really very awesome ! Can you please make a tutorial on chart in which suppose dates are displaying on x-axis and years on y-axis and % of attendance is displaying on the bars while all the data coming from mysql?? I have tried it many times but failed to do so.. It will be your great favor to me ..
you Guy all your tutorials are awesome please keep it up we appreciate so please keep it up. Hello, when i run this code in browser. I have the yield of my 2% 50% to 50% of the graph that should be 9.1% 9.1% that way. Could you help ?